If anyone is interested, just getting the word out. I plan to pick some up before Christmas. If you live in WY, southern UT, or NM I'll be on the road through those states over the next couple months and could drop them off if you are along the way and are cool with a deposit. Looks like a great deal. Do you want to deliver them to Indiana? No planed trips to Indiana. Call them and ask about freight shipping though. The other place I looked to source panels was here, They ship for sure. The shipping can be a killer. 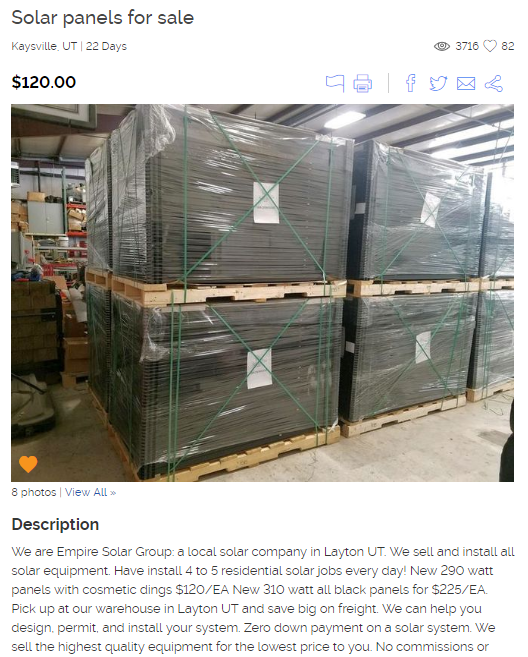 I bought a bunch of 300watt panels and the shipping amounted to about half the total cost.